“Love: It's Everything” from Christian Faith Publishing author Ernest M. Tegeder is a touching book that discusses the definition of love and how powerful it is, as well as the principles of love and God’s instruction for mankind as written in the Bible to extend love to one another. “Love: It's Everything”: an enlightening work that looks at love as an attitude and an element that can either be seen or be missing in people in different situations. “Love: It's Everything” is the creation of published author, Ernest M. Tegeder, an active professional musician performing as a trombonist and guitarist as well as a qualified composer and arranger who is a born-again Christian since 1972. Published by Christian Faith Publishing, Ernest M. Tegeder’s new book is a thought-provoking work that shows how love works in various life aspects and practical circumstances in order to point out that it does not play a small part in everyday life and allows readers to look at the concept of love in a more meaningful way. He also says that God—the author of love and is indeed love himself—helps everyone to become loving people with integrity. Without God, all amount to nothing. View a synopsis of “Love: It's Everything” on YouTube. Consumers can purchase “Love: It's Everything” at traditional brick & mortar bookstores, or online at Amazon.com, Apple iTunes store, or Barnes and Noble. 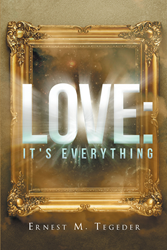 For additional information or inquiries about “Love: It's Everything”, contact the Christian Faith Publishing media department at 866-554-0919.